Sign up and receive Property Email Alerts of Houses for sale in Langebaan Country Estate, Langebaan. BIG DISCOUNT - NO TRANSFER DUTY PAYABLE!!!!! This "SOON TO COME" Single Storey Family Home is part of a New Development called "The Four Homes". 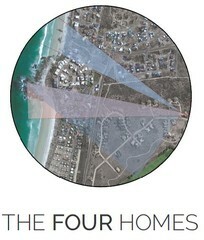 "THE FOUR HOMES" are constructed together and architecturally "communicate with each other", to be seen as UNIQUE yet PART OF A SINGULAR DEVELOPMENT. This "FIRST OF ITS KIND" concept in the famous Langebaan Golf Estate & Security Complex will be the ideal investment for a permanent family home or a vacation home. Staying in Langebaan Country Estate you will have access to the following Amenities: The very famous Golf Course, Gym, Swimming Pool, Club House with famous restaurant. All sporting activities such as tennis, Bowling, Diving Range etc. Sign-up and receive Property Email Alerts of Houses for sale in Langebaan Country Estate, Langebaan.